The importance of connectivity to enterprise IoT applications has increased as application data and computation has shifted toward the cloud. For these cloud IoT applications, architects need to ensure high-quality connectivity as part of the end-to-end design. Fortunately, a wide range of new session-oriented techniques are now available to improve resiliency. Connected devices of all kinds are generating huge amounts of data. Gartner predicts in excess of 20 billion installed IoT units by 2020. While consumer devices, like smart TVs, are the most ubiquitous, business applications will employ 7 billion devices. These enterprise devices range from broadly applicable devices for security systems and building controls to vertical-specific devices, like actuators for manufacturing and sensors for oil wells. All of these devices create a huge amount of data, which has been estimated as high as 847 zettabytes per year by 2021. Many enterprises associate IoT with broader, digital transformation initiatives. Often in response to threats from emerging competitors, companies are transforming their traditional business processes with digital technology. This can take the form of digital applications which might, for example, optimize asset utilization, reduce energy consumption or improve quality. For many of these use cases, the key elements are the IoT devices. A sensor might provide the data to determine whether an asset is being utilized, and actuators may be used to turn off elements of a plant which are not in use. IoT devices provide the key link to the physical world. The services and applications processing the IoT data can operate anywhere from on site, directly connected to the IoT device, to around the globe, connected to the device over the internet. Certain use cases may require local compute such as latency-sensitive applications or when security concerns might limit the distribution of data beyond a locality. A local approach is often the simplest design which architects employ in the preliminary phase of a transformation initiative. However, many emerging applications are operating or storing data in the public, private or hybrid cloud. These cloud applications are driven by the general trend of IT shifting to cloud infrastructure because of benefits such as reduced cost, flexibility and disaster recovery. For transformation initiatives, especially, business processes often span the entire company, so companies prefer centralized data collection, processing and retrieval. The importance of connectivity in an IoT application is related to the location of the application data and processing, as shown in the figure below. In the left “Device” extreme, if the data and compute for the application are located inside the device, connectivity is obviously not needed. For example, a traditional programmable, wall-mount thermostat includes a temperature sensor, control wires connected to the heating system and a microcontroller application which operates perfectly fine without internet connectivity. At the right “Cloud” extreme, a remote temperature sensor that streams all data to the cloud without a local interface is useless without a working network connection. 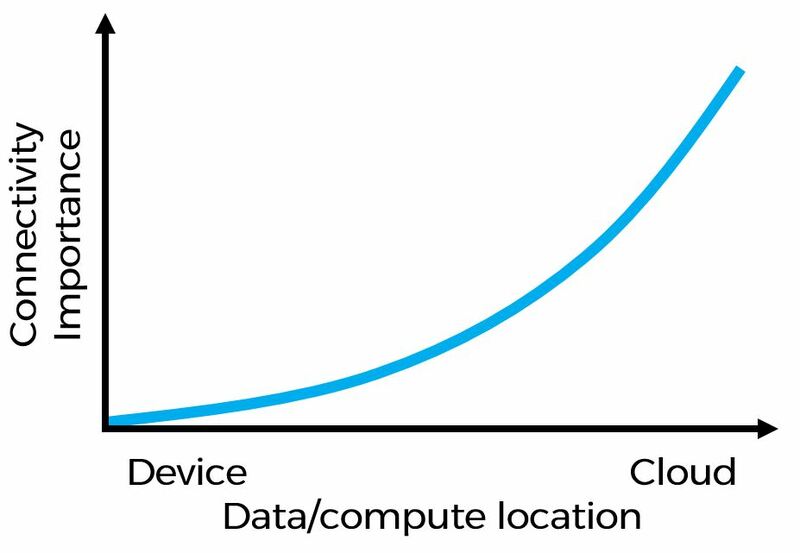 As more IoT applications push data to or require compute in the cloud, the importance of connectivity to the remote location increases. If the network quality is poor in terms of bandwidth, packet loss, latency or jitter, then the IoT application can suffer. As enterprise architects develop transformative cloud IoT applications, they need to design for high-quality connectivity from the remote location. Session-oriented technologies can improve the quality of network connectivity from remote sites or IoT devices to the cloud. Typically, connected devices send data across the internet using standard protocols, creating a session with the remote server. In cases with a single network path to the cloud, session remediation techniques compensate for packet loss and jitter on the intervening network. Session optimization can improve aggregate bandwidth on a high-latency or high-loss path by compensating for protocol inefficiencies. Connectivity quality can be dramatically improved in scenarios where multiple paths are available from the IoT device to the cloud application. Real-time path monitoring techniques measure the quality of all paths on very short time scales, and then multipath routing techniques select the best possible path for a particular application. Once a path has been selected, if a session begins to experience a problem in terms of loss, latency or jitter, session migration can move the active session from one path to another without disrupting the end-to-end application. Together these technologies can make IoT applications resilient. Network connectivity has become critically important in many transformative IoT applications. Compared to traditional, local applications, the move of IoT application data and computation to the private, public or hybrid cloud makes connectivity far more important to application performance. Recently, vendors have introduced several new technologies which can improve the quality of network connectivity, providing IoT application architects with a powerful tool to ensure digital transformation.